Whenever you are having problems with your pipes, you need the assistance of a professional and capable Bound Brook, NJ, plumber by your side. Having someone who knows what they are doing gives you the opportunity to trust the results will be to your satisfaction. Choosing Jeffrey Burke Plumbing and Heating LLC gives you an experienced plumber along with services dedicated to your satisfaction. 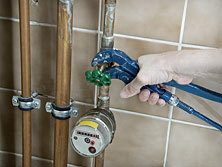 We know problems with your plumbing can quickly become stressful and messy. While you want quality results, you are likely more concerned about when they will happen. With us, you are not only receiving the outcome you want, but you are also getting them quickly. We offer 24/7 emergency and same-day services, ensuring you can relax a little when something goes wrong. As an insured, licensed, and bonded business, you can trust us to deliver on our promises. Having this backing us up can give you some relief during the entire experience. Our free estimates are also capable of taking your mind off any financial concerns you might have about working with us. Jeffrey Burke Plumbing and Heating LLC is capable of providing you with quality work and services all around. When you need the assistance of a Bound Brook, NJ, plumber, you can contact us at any time. We are available to help you fix these situations and keep you happy. Call our team today. Copyright © Jeffrey Burke Plumbing and Heating LLC. All rights reserved.